style conventions used throughout the post. This section describes the minimum Run/Debug configuration necessary to debug a python for GAE application. It must be set on a per project basis. You’ll need a pre-existing GAE application for this to work. If you don't have a GAE app to work with, see the prerequisites section for instructions on how to set up an example GAE application. Select your base project directory (the one which contains an app.yaml file). For our examples we’ll be using the folder C:\engineapp, which we’ll refer to as <engineapp_path>. Click the green plus sign "+"
In the Add New Configuration list, select Python. These are the minimum arguments needed for the debugging to work. Ensure you include the final argument, ". ": it means the current path, i.e. the working directory in this case. This creates configuration file <engineapp_path>\.idea unConfigurations\GAE_config.xml, which can be shared with other users and put in version control. Ensure the option Attach to subprocess automatically while debugging is ticked. 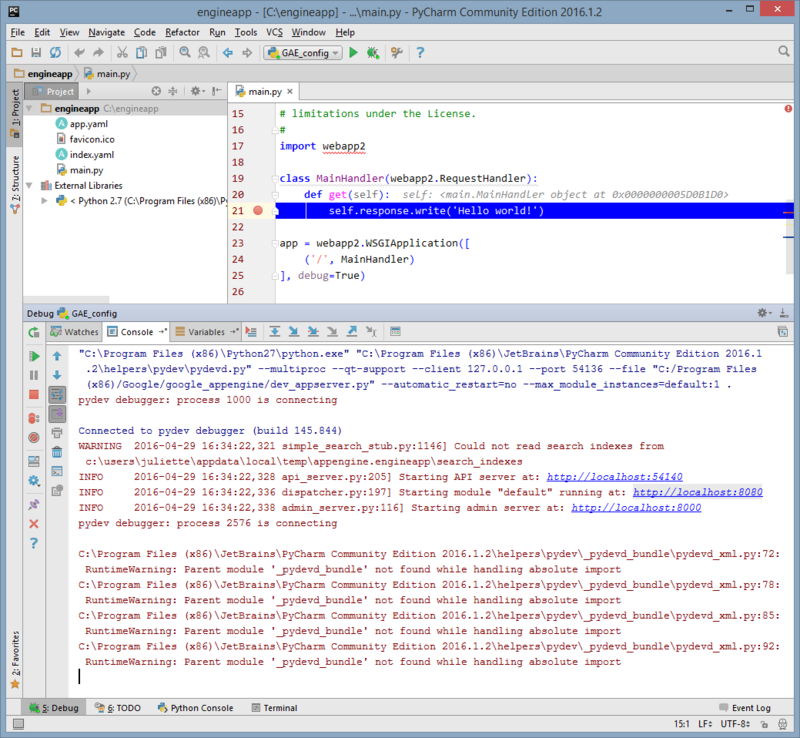 The basic PyCharm configuration for python GAE debugging is done. The following steps are optional. To enable PyCharm's code navigation and completion, we need to add the GAE SDK to PyCharm's list of External Libraries. Update the paths C:/Program Files (x86)/Google/google_appengine to your <GAE_install_path>. If you'd like to use a per user path variable instead, see the next section. If you need more GAE libraries, add them to the list (in a similar way to webapp2, django and jinja in our example). GAE_SDK is listed under External Libraries in the Project viewer (View > Tool Windows > Project). In the python code, you can open class definitions (right-click on class) and code completion works. 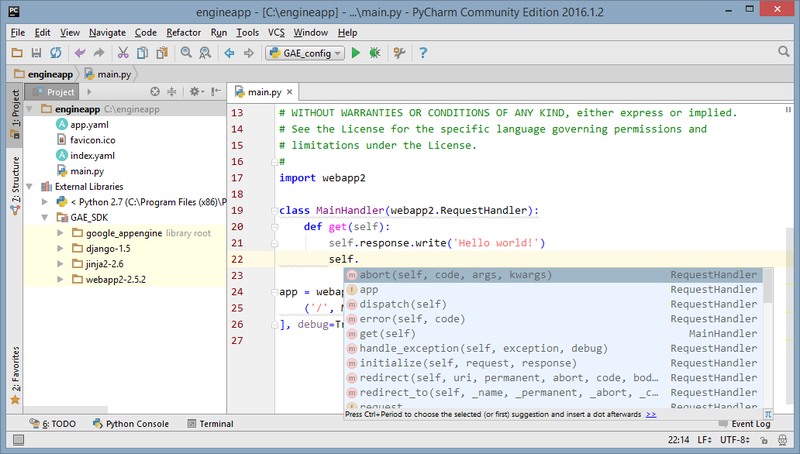 The PyCharm configuration for python GAE code navigation and completion is done. The following steps are optional: replacing <GAE_install_path> with a per user path variable is mainly useful for large, shared projects. The configurations described above have to be repeated for each project. To be able to store the settings in files that can be shared across projects and users, it is useful to define a path variable for the library location. 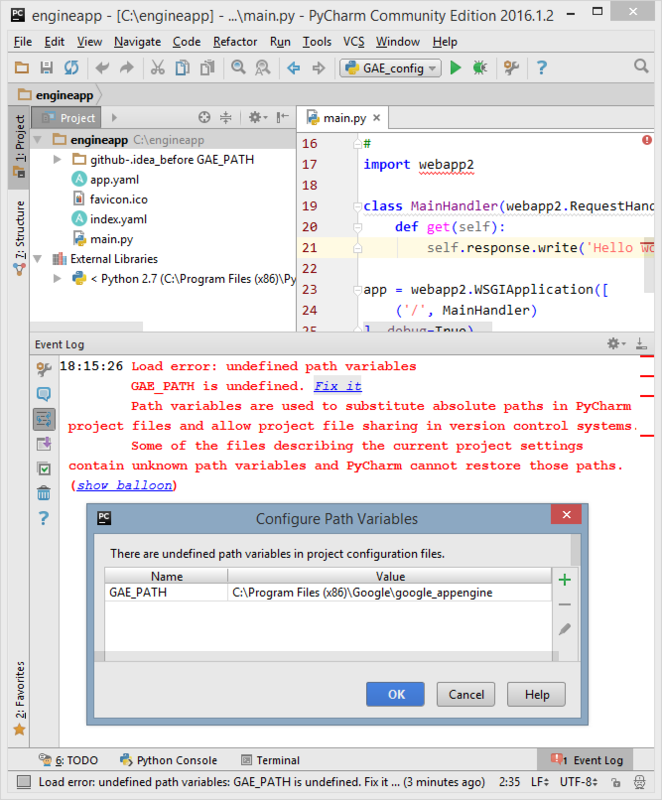 For the same result, there are two ways to replace <GAE_install_path> with the PyCharm path variable GAE_PATH: through the PyCharm UI, or by editing the PyCharm files directly. replace all instances of <GAE_install_path> with $GAE_PATH$. Note: at this point GAE_SDK is not listed under External Libraries. Event Log, a Load error: undefined path variables message about undefined variable GAE_PATH is displayed. Click the Fix it link. In the Configure Path Variables window, set the value of GAE_PATH to <GAE_install_path> and save. Note: This step creates a user file, path.macros.xml, that contains the Path Variable GAE_PATH's value. We haven't found out how to open the Configure Path Variables window other than by triggering the Load error. In addition, opening the window by clicking Fix it only works on the first attempt. Workaround: restart PyCharm. GAE_SDK is listed under External Libraries in the Project viewer. Make sure to include the $ signs on wither side of the variable name as this denotes that it is a PyCharm path variable. Replace <GAE_install_path> with the actual GAE install path. To summarise, we need four files to record the debug settings, external libraries mapping and path value. Python debug configuration for GAE. Setup instructions: Configure python GAE debugging. Note: GAE_config.xml is created when Share is ticked in the GAE_config python configuration. List of external libraries grouped under the name GAE_SDK. Setup instructions: Enable code navigation for GAE libraries. Contains -amongst other project settings- the name of the external library GAE_SDK. Contains the path value for GAE_PATH. Setup instructions: Set a path variable for GAE. Default GAE installation path where dev_appserver.py and lib, the Google libraries directory, are located. Name of the GAE python application and the PyCharm Project. Name of the PyCharm project's Run/Debug Configuration used to specify dev_appserver.py as the configuration to run when executing python code. In this tutorial, GAE_config is used as is. Name of the GAE libraries in PyCharm's list of external libraries. If you choose a different name, ensure you update the file name and the xml code accordingly. In this tutorial, GAE_SDK is used as is. In this tutorial, GAE_PATH is used as is. You'll encounter the notation $GAE_PATH$. The $ signs tell PyCharm it is a variable. is for values to be entered as specified. is for values that are provided as an example and may need to be replaced by your own (e.g. absolute paths). is for comments, extra information or tips.